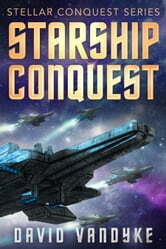 STARSHIP CONQUEST is BOOK 1 in the Stellar Conquest series and was previously published as FIRST CONQUEST. From Hugo Award finalist and bestselling author David VanDyke. When the crew of EarthFleet's most powerful dreadnought Conquest is sent on a mission forty light years from Earth, none of them expect to return. But to find a home and keep humanity safe from hostile aliens, they must fight to seize a new world, initiating EarthFleet's first conquest of another star system. Starship Conquest is Book 1 of the Plague Wars: Stellar Conquest series, which carries the Plague Wars series forward a century into the future when humanity turns to the stars to find its destiny. It tells of a bitter battle as EarthFleet smashes into an alien star system in a desperate first strike to save humanity. Follow the starship Conquest as its captain and crew take the fight to Earth's enemies, finding allies and making heroic sacrifices in order to secure the future of Earth's solar system against a hostile universe. Good action read. Interesting concepts of space war. Well written. Flows well and provides enough detail to keep your interest high. Exciting from the start with good characters. Build up to a good conclusion. I enjoyed the book so much I couldn't put it down until the end and I'm looking forward to buy the following very soon. Good read Fun and fast moving. A bit short, wanted more to read, now I have to buy the next book!